If you hear the term the Skirt Steak and think of a pink tutu well youre not that far off, although chances are you wont be seeing any ballerinas dancing with one of these on anytime soon. This cut is hailed by chefs as the cut that with a little tender love and care can really reward those who give it a go. 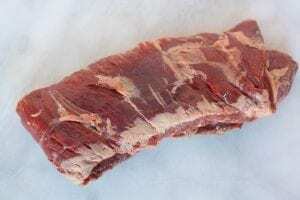 The Skirt steak is a thin, long lean cut that sits along the inside of the abdomen wall and could be, with a little imagination, a pink Skirt. Its a slightlytougher cut but all you need to do is unleash some gorgeous marinade on the Skirt steak and watch as the cut softens and builds in flavour. Okay, it doesnt go that quick, but it doesnt take that much time for the marinade to work its magic. To make sure it doesnt turn out tougher than when you started, be sure to cook this cut hot and quick to rare or medium rare or alternatively slow-cooked the cut instead. Forget what school taught you about going against the grain, with the Skirt Steak it should cut against the grain just before serving. The grain is the long strands of fibres that run through a piece of meat, by cutting against the grain it means you cut those fibres, making the meat easier to chew and adding to its tenderness levels. This cut is very versatile and is almost always found in Mexican Fajitas and stir-fries. Dont have a Skirt steak? Try out a Flank or Hanger Steak.